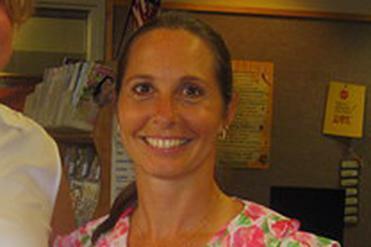 Dawn Hochsprung, the principal at Sandy Hook Elementary School, was known for her playful passion and infectious laugh. A month ago, she dressed up as the Sandy Hook Book Fairy — wearing a crown and a dress that lighted up — to inspire first-graders to read. Diane Day, a therapist at the school, told The Wall Street Journal that she was in a meeting with Hochsprung about 9:30 a.m. when they heard shots. Hochsprung and a school psychologist ran toward the sound of the gunfire, Day said. William Glass, a deputy school superintendent in Danbury, told The Stamford Advocate on Friday that he had received confirmation that Hochsprung was one of the adults killed at the school. Glass told the newspaper that he had previously hired Hochsprung to work as an assistant principal in the Danbury school system. ‘‘She had a tremendous intellect and a wonderful way with children,’’ he told the newspaper. Hochsprung, 47, was married to George Hochsprung, and is the mother of two daughters and three stepdaughters, according to a 2010 article in the Newtown Bee, a community newspaper. She became Sandy Hook’s principal in 2010, telling the newspaper at the time, ‘‘I don’t think you will find a more positive place to bring students to every day.’’ Before that, she had worked for 12 years as an administrator in public schools. Lynn Wasik, whose daughter attends Sandy Hook, said Hochsprung could often be seen crouching down to speak to her students at eye level. ‘‘She connected with the children,’’ Wasik said. Hochsprung maintained a Twitter account, from which she regularly kept her 1,000 followers informed about what was happening at the school. A number of her tweets were accompanied by photographs of a school she seemed proud to show off. A photo she tweeted Oct. 17 showed her students lined up outside for an evacuation drill. ‘‘Safety first at Sandy Hook,’’ Hochsprung wrote.